Introduction of our own Basic Wind Speed maps to ASCE 7-10, ASCE 7-16, TIA-222-G and TIA-222-H. Improvements to automated Exposure Category (Kz) detection to ASCE 7-10, ASCE 7-16, TIA-222-G and TIA-222-H.
New automated Topographic Factor (Kzt) detection algorithm to ASCE 7-10, ASCE 7-16, TIA-222-G and TIA-222-H based on Crown Castle and SEAW RSM-03 guidelines. 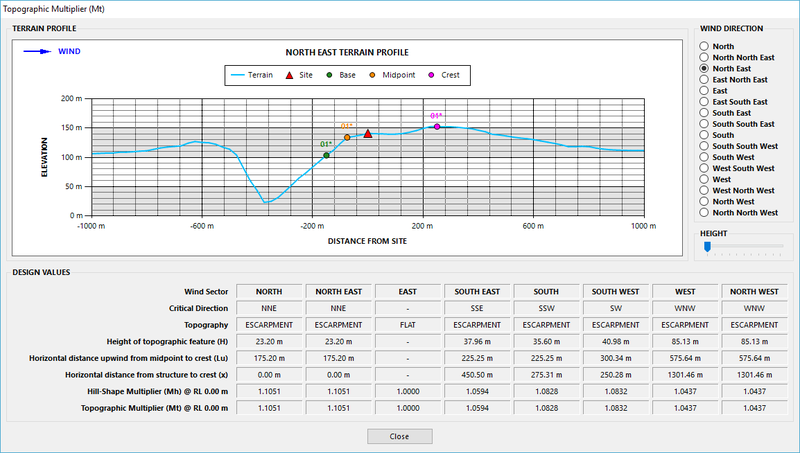 Until now, CHECKWIND has used a combination of the 500 m segment criteria from the AS/NZS 1170.2 commentary (though with a “rolling” 500 m segment instead of less accurate 500 m increments from the crest suggested by AS/NZS 1170.2), in addition to our own local minimum criteria to determine the base of a feature.